A series full of warmth and weddings, Christmas Promises at the Little Wedding Shop by Jane Linfoot is the fourth instalment taking place at Brides by the Sea. This time around our protagonist is Holly, a food photographer who grew up in the seaside town of St Aiden and now lives in London. This is her first Christmas alone after a break up, being a year since her boyfriend proposed to her and she left him waiting for an answer. She has regretted her stunned silence ever since, and has spent the year wishing he would take her back. With the prospect of a lonely Christmas facing her, she accepts an offer to photograph a winter wedding and returns to St Aiden with the intention of lying low. 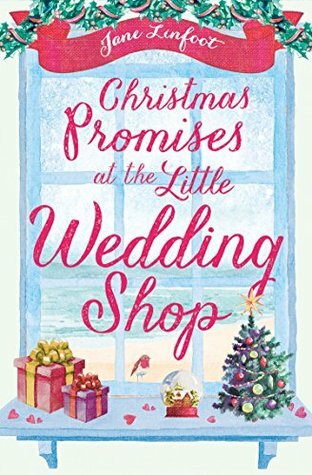 Of course, nothing ever goes to plan and Holly finds herself being taxied to Brides by the Sea in Santa’s sleigh, complete wjth an elf by her side. This wouldn’t be so bad, except for the fact that they run into Rory, an old face from Holly’s past who has a habit of teasing her for her rosy red cheeks. To him, she is Holly Berry, or just Berry for short, and Holly is surprised to see that he hasn’t moved on from this small town. He is the last person she wanted to see, yet somehow it is still a comfort to be reminded of old times. With the worry of photographing her first wedding on the horizon, Holly finds herself unwittingly conned into accepting more wedding jobs, as formidable Brides by the Sea owner, Jess, grooms her to become their in-house photographer. This means being thrown together with Rory, often the only available pair of hands to help out at the last minute. He knows Holly is still yearning for the love that she lost, but could she be missing something else right under her nose? I thoroughly enjoyed this return to the little wedding shop, and thought Holly fit in perfectly with the other characters seen in previous books. You don’t need to have read the others, but I think it does enhance the enjoyment of this one, especially given some of the quips being made. However, Holly easily holds her own as a protagonist and is introduced with plenty of history to give her a well-rounded sense of character. From the very beginning you can understand how her mind works, and become attuned to both her strengths and weaknesses, willing her to succeed. She is full of self-doubt about her skills, and needs that extra reassurance (often from Rory) to make her believe in herself. Wedding photography is a completely new field for her, and at times the pressure is almost too much, and she is tempted to throw in the towel. However, despite Holly often being hot headed and impulsive, she is yet to realise that that may have saved her from an unhappy marriage, leaving her heart open for something new. Where Rory is concerned, they share an easy companionship, with Holly never having to justify herself to him. Despite knowing that she still pines for her ex, Rory is always there when she needs him, no questions asked. This is on top of his own problems, as he has been left to care for his sister’s two young children whilst she is in hospital. He is almost as out of his depth as Holly is, demonstrating that he is pretty clueless when it comes to children. This provides for much of the comedy throughout the book, especially when trying to reign in his language around the kids. As a Christmas-themed novel this was everything I wanted it to be, full of cheer and warmth to bring a smile to your face. Holly had her own insecurities to work through, complemented perfectly by the rapport building between her and Rory. This meant that there was just the right level of both character and relationship development throughout, with it being easy to sink into the story and become engaged in the cosy storytelling. Another great instalment to the series, I can’t wait to return to the Little Wedding Shop again soon.